University of California Press, 9780520272323, 320pp. 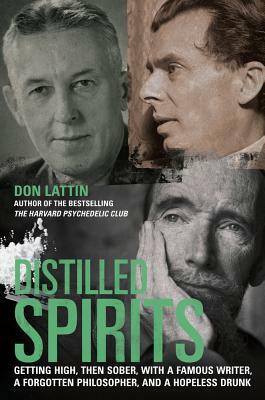 Distilled Spirits blends a religion reporter’s memoir with the compelling stories of three men—Aldous Huxley, Gerald Heard, and Bill Wilson—who transformed the landscape of Western religion and spirituality in the twentieth century. Huxley, celebrated author of Brave New World, ignited a generation that chased utopian dreams and sought enlightenment through psychedelic drugs. Heard, an Anglo-Irish mystic, journeyed to California with Huxley in the 1930s to lay the foundations for the New Age and human potential movements. Wilson, the co-founder of Alcoholics Anonymous, joined forces with Huxley and Heard in the 1940s and 1950s, when Wilson began a series of little-known experiments to see if LSD could be used to help diehard drunks. Their life stories are gracefully brought together by veteran journalist Don Lattin. Lattin recounts his own rocky personal journey from 1960s and 1970s counter-culture, through the fast-living, cocaine-fueled 1980s and 1990s, to his long struggle to get sober. By weaving an intimate account of his own recovery with the lives of the book’s three central characters, Lattin shows us the redemptive power of story telling, the strength of fellowship, and the power of living more compassionately, one day at a time. Don Lattin is the author of The Harvard Psychedelic Club: How Timothy Leary, Ram Dass, Huston Smith and Andrew Weil Killed the Fifties and Ushered in a New Age for America, Jesus Freaks: A True Story of Murder and Madness on the Evangelical Edge, Following Our Bliss: How the Spiritual Ideals of the Sixties Shape our Lives Today and Shopping for Faith: American Religion in the New Millennium. For more information, please visit www.donlattin.com.